A new company named “Float” wants to eradicate credit cards for good, though let’s be honest, there’s no chance of that happening. The company has developed a novel approach to lending, seeing that they offer interest-free loans with no penalties or fees. You may be wondering how that’s even possible. At first glance, it kind of sounds like a no fee balance transfer credit card, but it’s not at all the same. Float says it is both a lender and a shopping club, in that you must buy items through their shopping portal to access one of their credit lines. It works like this. You make your everyday purchases through Float, instead of say at the merchants’ websites or brick and mortars directly. For example, if you want to buy something on Amazon.com, you must purchase it via Float’s portal to get credit for the purchase. This is similar to the Upromise rewards program from Sallie Mae, which rewards members for shopping via its portal. The big difference is that Float purchases expand your interest-free credit line, whereas the Upromise program gives you cash back. Your Float credit line is, or “Float Line” as it’s affectionately known, is determined by your average monthly spending and your FICO score. Per Float, a consumer with an 800+ FICO score starts out with a membership level of 200, meaning the Float Line is 200% of the average monthly spend. 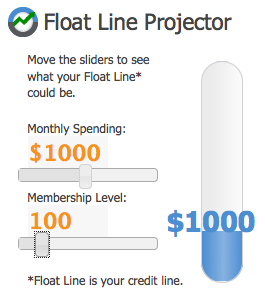 So if you’ve got excellent credit and spend $1000 a month in the Float portal, you’ll have access to a $2,000 Float Line. For the record, membership levels range from 10 to 500, meaning if you only spend $100 a month via Float and have a membership level of 10, you’d wind up with a meager $10 credit line. Of course, Float only allows draws on lines greater than $200 to avoid that silliness. But Float encourages its users to rack up the spending by purchasing gift cards via the company. Float receives a commission from merchants when its users buy gift cards and/or shop at the merchants through Float. This enables Float to turn a profit, and part of that money can be leant to users in the form of credit lines, as opposed to levying finance charges. Float’s latest venture is its “Planned Spending Program,” which they see as both a budgeting tool and a way to quickly build a large line of credit. For PSP users, who essentially schedule purchases via Float each month, they get access to discounted gift cards, along with an “extra boost” to their membership levels. Additionally, those who plan their purchases in advance each month may be more likely to save money than those who shop erratically. A lot of financial planners recommend that you have an emergency fund in case, well, you happen upon an emergency. You know, if the car won’t start, or if Timmy has 20 cavities, or if the dog eats something it shouldn’t have. Without access to a line of credit, you could be forced to charge up the old credit cards, which Float pointed out have average interest rates of 15%. There are also those who don’t have high enough credit scores to qualify for credit cards or lines of credit. For these consumers, Float allows them to prove their worth over time and gain access to credit if and when needed. In the Float Dashboard, a user can apply for a “draw” at any time they’d like simply by filling out an application. The loan funds are then deposited into the user’s desired account within two business days. From there, the loans must be repaid in equal monthly installments for 10 months. For example, if you ask for a $1,000 draw, you’ll need to pay back the line in $100 monthly payments for 10 months, all with no interest charged, just like a 0% APR credit card. The difference, of course, is that you won’t be able to leave any remaining balance of the loan outstanding, unlike credit cards. This keeps Float users out of debt, which is pretty much the opposite of credit cards. If you can’t pay back your Float loan, the company says it’s willing to work out a deal to repay the loan. But if you don’t pay or work with Float, they will report the delinquency to the credit bureaus and possibly sell your loan to a debt collector. In other words, there are consequences to missing payments. FYI: Float currently lends in only a handful of states, including Florida, Georgia, Michigan, New York, Texas, and a few others. For someone without access to credit, Float makes sense. However, it takes a bit of legwork. You need to do most of your shopping via Float, which could wind up being a pain in the rear. Float promotes the use of gift cards, which they refer to as “shopping cards,” but we all know gift cards can be burdensome, especially when you don’t know the remaining balance, or if you misplace them. If you have good credit, a Float Line isn’t really all that necessary, seeing that you can take out a 0% APR credit card, or use a balance transfer to defer interest for X number of months. Additionally, Float doesn’t actually reward users with points or cash back. Instead, you just get access to an interest-free credit line. So potentially nothing if you never actually use it. Conversely, standard credit card users can take the cash back they earn each month and deposit it in a rainy day fund just the same. So for those who can manage credit responsibly, taking the cash back makes more sense. 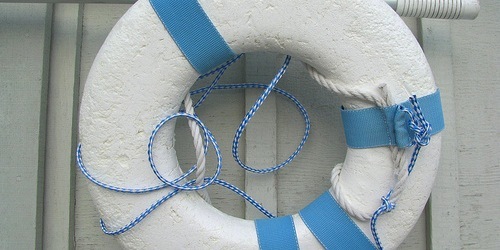 But for those who are fearful of credit cards (or unable to qualify), Float may be worth a shot. Either way, it’s important to maintain good credit so you have access to other key loans, such as auto loans/leases and mortgages. Tip: Float will pull your credit report, resulting in a credit inquiry when you apply for a loan or ask that your membership level be raised. This means it can build both positive or negative credit history, depending on how you use it.